Greetings, lovely food enthusiasts of Summerland. Before we begin the tour of What We Ate in March, please save the date for our Vegan/Raw Vegan Potluck on April 19 at Purple Hemp on Victoria Street. Start time: 6pm-ish. RSVP: Join the Facebook event or email me at pleasebringcake@gmail.com to let me know you’re coming. We’ll have the opportunity to meet some of the health practitioners at Purple Hemp and learn a bit more about the company. Notes for this event: If your dish is gluten free, please include a label to help our friends with celiac know which dishes they can safely eat. As always, remember your Tupperware for leftovers! This month we enjoyed a spectacular Canada-inspired potluck at Maple Roch’s beautiful new store on Victoria Street. Our hostess was the one and only Mirjana, who made us maple-spiked Caesars and let us be among the first to sample the maple syrup that was recently tapped from Summerland trees. We discovered this was to sweeten us up for Mirjana’s Really Hard Canadian Food Quiz. I scored a whopping three points. Download the quiz to learn some interesting Canada Food Facts. As always, I missed out on some photos, including LeeAnna’s Mars Bar Smartie Squares (Because Mars Bars are Canadian!) You’ll just have to imagine the chocolate gooey goodness punctuated with nubbins of sweet smartie. It’s worth noting that this meetup marked the first time a hair dryer was used as a warming tool. Challenged with refreshing the meltiness of the cheese for her Deconstructed Bacon Grilled Cheese with Caramelized Onion Marmalade, Dorthea deftly employed the hair dryer to achieve ideal cheesy softness. I hope the next time a cheese sandwich needs heating someone will carry on Dorthea’s boldness and attempt the Sam method. Onward with the rest of the treats! Jan’s Saskatoon Berry Tarts. What a treat to eat Saskatoons out of season. They were just sweet enough, just tart enough, and absolutely lovely. 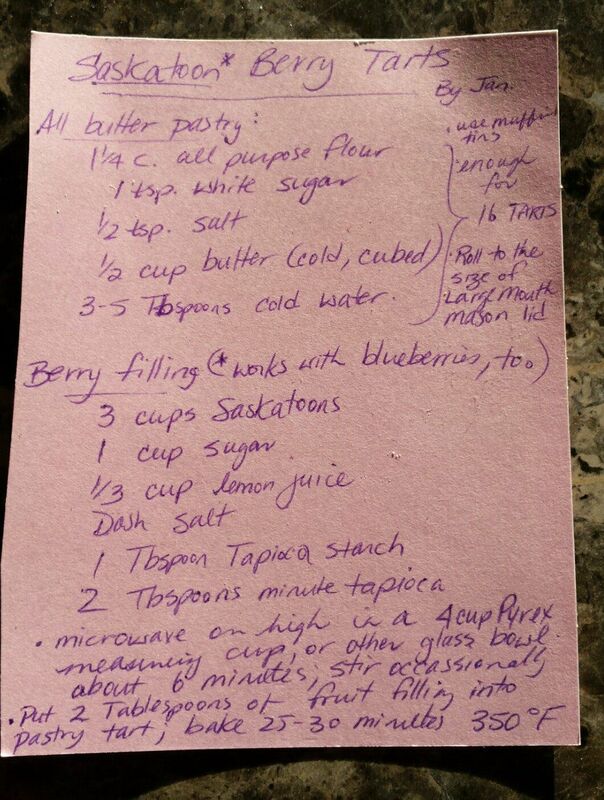 The recipe for Jan’s Saskatoon Tarts. Click to see a larger version. Lorraine’s Beef Is Canadian! Swiss Steak. Rich gravy = extremely tasty. Kim’s Red Fife & Barley Winter Salad. Part of why I love the whip round is it gives a chance to tell the stories of our culinary adventures. Kim is a natural storyteller and I love hearing the tales she brings to go with her creations. This time we learned how wheat made its planting debut in 1005, and how in 1842, David Fife began growing Red Fife (which has its origins in what is now Western Ukraine) in Ontario. She shared that barley was first grown in Newfoundland in 1578 and that in 1668 the first brewery opened in Quebec City. Commercial crop production of barley began in 1812. Mmmmm…delicious food knowledge. Jean’s “Maple” Maple Cookies. Jean is extremely good at this kind of crisp-yet-buttery style of cookie, as those of you who experienced her tea bag cookies at our Victorian High Tea meetup back in 2014 can attest to. Click the photo to relive the recipes of our tea party adventure. Jean also whipped up a batch of Maple Cream Puffs. As one does. Don’t you just want to pick one up and eat one right now? I do. Tangy alert! Victoria’s Cranapple Maple Baked Beans. Vegan and gluten free, it was very hearty and warming. I must try this for myself. Val’s Maple Coffee Cake. This cake had presence. It was a splendid match with my cup of breakfast tea the next morning. A full cup of maple syrup went into Janice’s Maple Bread Pudding. Comfort food of the gods. Welcome back to Summerland, Beth! And thank you for bringing Chocolate Truffle Balls spiked with maple. These were also nice with a cup of tea. Click the recipe below for the larger image. Sophia’s Smoked Salmon Mousse with True Grain 9-Grain Crackers. 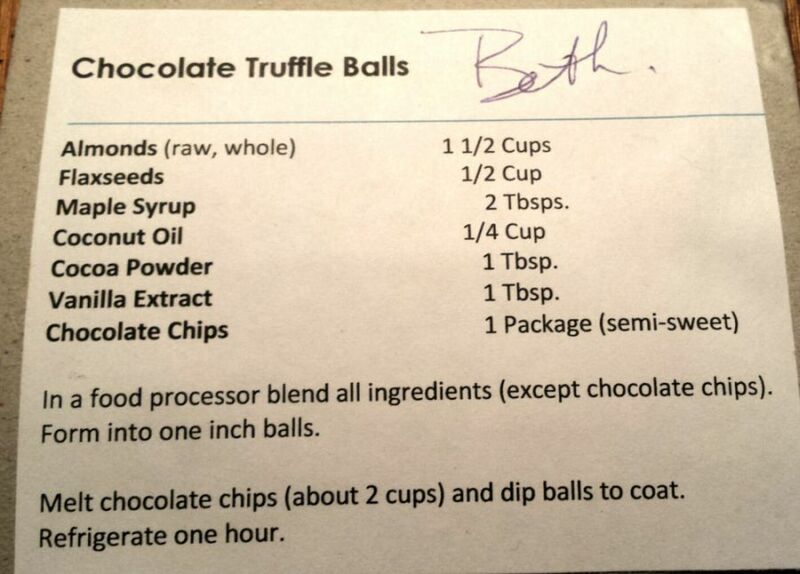 A quick recipe when you’re pressed for time but want something decadent. Click the photo for the recipe. Don, who says he could happily live on salmon, paired his marinated salmon dish with a lovely 2017 Tangle Tree Cabernet Sauvignon from South Africa. I hope no one wants any more of the wine, as my sources tell me Don has scoured the valley for the remaining bottles. Laura’s Barley & Corn Casserole. I feel healthier every time I look at this photo. Also very nice with red wine. We didn’t have any Nanaimo Bars, but our Canadian Classics challenge was enhanced when Chantelle revealed she’d brought Butter Tarts. And that’s what we ate in March. I hope I didn’t forget anything. A wonderful time was had by all. Thanks again to Mirjana and to Maple Roch for hosting our wild gang. See you at Purple Hemp for Vegan night!